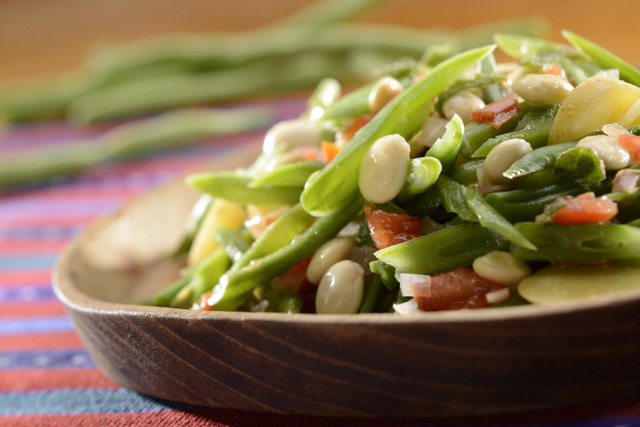 This hearty and light green bean salad or side dish is made with chochos (lupini beans), grean beans, potato, tomatoes, onions,olive oil, and fresh herbs. This recipe and post on adding more healthy tasty dishes to your menu comes from guest blogger Michelle O. Fried. Michelle is an ecological public health nutritionist and an advocate for the nutritional value of the traditional food and ingredients of Ecuador and the Andes. Even though this would be called a salad in most Latin countries, it’s also a wonderful vegetable side dish, and if you serve a large portion, it could serve as a main dish, too. I love this dish served at room temperature with a little drizzle of additional olive oil. Warm it´s also excellent. Chochos (lupini beans) and green bean salad or side dish made with green beans, chocho beans (lupini beans), potato, tomatoes, onions,olive oil, and fresh herbs. In a thick, low pot with a lid, sauté the diced onions in the olive oil until it begins to brown. Add the cut green beans, diced potato, chopped tomatoes, and water. Cover the pot and cook over the lowest heat possible, mixing from time to time until all is cooked (approximately 20 minutes). Add the chochos or lupini beans and cooked until they are heated. Add salt and pepper to taste. Then stir in the minced herbs you have chosen. Forget diets!! Let me help you eat delicious, healthy food all year round. And let the ingredients be ancient ones from the Andes. Now that we have all indulged over the holidays, and perhaps our stomachs and our weight are not in good shape, we can think of moving towards enjoying healthy foods that are also really delicious. How we eat is also important. To begin with, if we have a tendency to eat more than our body needs, try drinking at least a big glass of water half an hour before all meals. Then, when eating, chewing slowly gives the opportunity to really taste. This kind of mindful eating makes all the difference. And when we eat slowly, we will feel satisfied earlier and thus eat less. Tomatoes originated in South America, too. Their flavor and juiciness cannot be matched by those hot-house, almost square things full of nasty pesticides that may suit commercialization processes but certainly don´t suit my taste buds. Often even their smell is obnoxious. Again, this year I resolve to spend the extra time and perhaps cost to buy only organic or agro-ecological tomatoes. Beans are a healthy source of protein and in comparison to animal protein barely have a carbon footprint and do not load us with antibiotics like chicken and other animal products do. Cultivating beans doesn´t require destroying the Amazon or other forested areas and beans don´t produce methane like cattle. Laylita, I’ve bought Lupini beans, but when I boil them, they don’t taste our have the texture of Ecuadorian chochos at all! Is there a method to making them in the u.s.? Hi Paulina – You have to boil them until tender, but they will be very bitter, so then you need to cure them in brine (salt + water), changing the brining liquid 1-2 times a day, for about 7-10 days – until they no longer have that bittery taste. I’ve been planning to post a more detailed tutorial on doing this, so will add it to the top of my list. Thank you, Laylita. This entire posting came out so beautifully. You have no idea how much I appreciate your sharing my healthy, delicious recipes with your wide audience.